I seriously cannot stand pretentious and arrogant people who seem to have a hobby of flaunting their wealth, grades or achievements. It is damn irritating. On the other hand, it is the minority of individuals who dwell in humility despite their social standing or achievements that really impress me. In the same light, my view of Dempsey veers towards the former. Catering to the young, flashy and wealthy, the days where Dempsey used to be a secluded and romantic getaway are no more, leaving behind instead what I feel to be a superficial shell of its former self, where food and drinks are heavily overpriced. Ok maybe it isn’t that bad, one might still encounter an ambience of tranquilness and serenity at Dempsey but it’s mainly limited to weekday lunches. However, I tend to avoid going over there for dinners, especially on Weekends, where parking is always a problem and where rave parties seem to be going on at every corner. Anyway, fellow CCA-mate and long time friend GR really wanted to have the Truffle Fries (which I think is highly overrated) at Barracks so despite it being a Friday night, I obliged, though rather reluctantly. 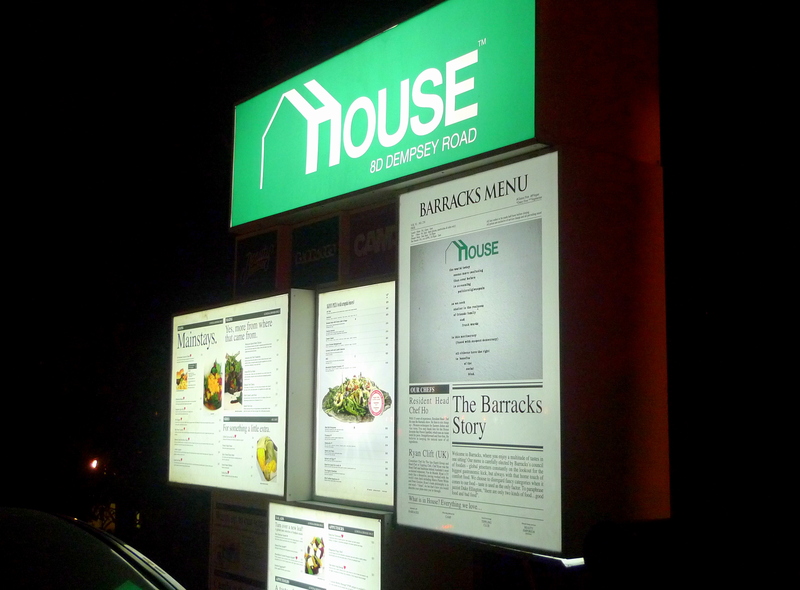 Barracks is a up-market casual dining restaurant, which to me just means less bang for your buck. Like most Singaporeans, I believe in getting a good deal, so while I don’t shun spending on food, I do believe in getting the most value of my dollar. 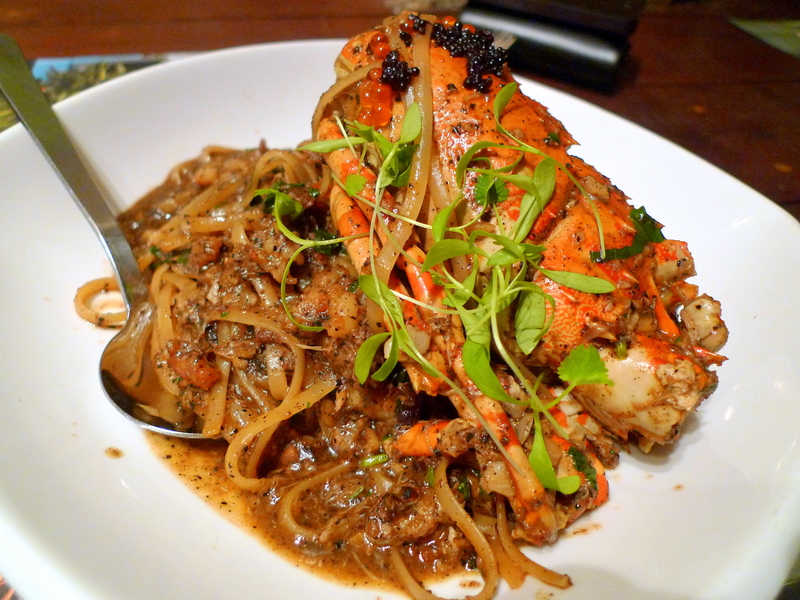 C had the Lobster Linguine($29++), which was essential a Half-Lobster Linguine, Crabmeat & Prawn Bolognese tossed in Black Pepper Sauce. 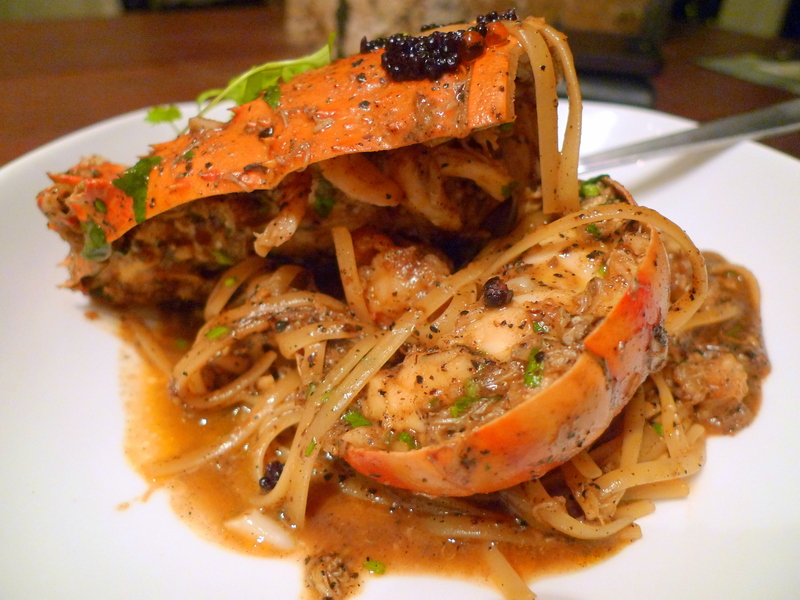 This reminded me much of black pepper crab, which I thought took surprising well to the linguine. S & GR both had the Fish & Chips($27++). Apparently, Cod fillets are used which explains the price premium. 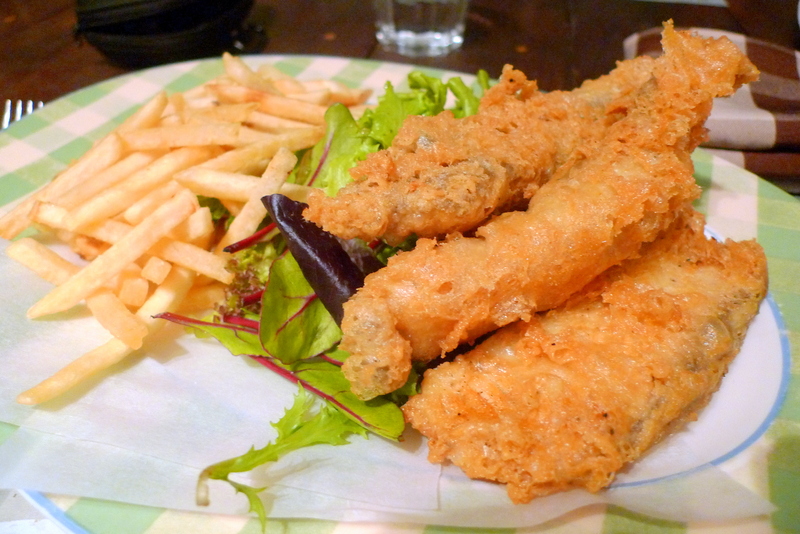 One good point is that the chips served for this dish are the highly raved about Truffle Fries, one bad point is that GR had a tummy ache after the meal and I do feel that battering a cod for fish and chips is soooooo wasteful don’t you think? Adwyn had the Jamaican Jerk Pork Tenderloin($24++), which rested over a bed of Fruity Peach Cranberry Chutney, Garlic Roasted Potatoes and Grilled Vegetables. While the Tenderloin was nicely seasoned, I thought it could have been done a bit more tenderly. 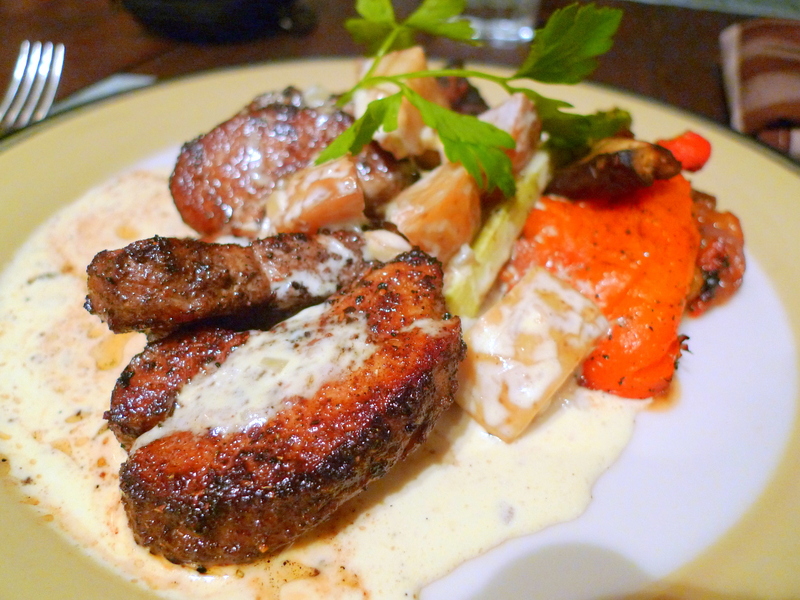 But if you want a recommendation for Pork Tenderloin, my suggestion is to go for the awesome Yorkshire Pork Tenderloin at Perle Noire, a humble Oyster and Grill Bar in the Siglap area. It’s been more than a year since I last patronized and I’m still hankering over it which means it must be good! (Perle Noire so happens to have a 1-for-1 main course for Citibank Card holders currently, though the condition of the promotion is to make a purchase of a dozen oysters). Ok reverting back to the Jamaican Jerk Pork Tenderloin, what I thought really stood out was the Roasted Garlic Potatoes, which had a soft texture (from cooking and not from being overripe) and very palatable. If Barracks offered this as a separate side, I would definitely order it on my next visit. 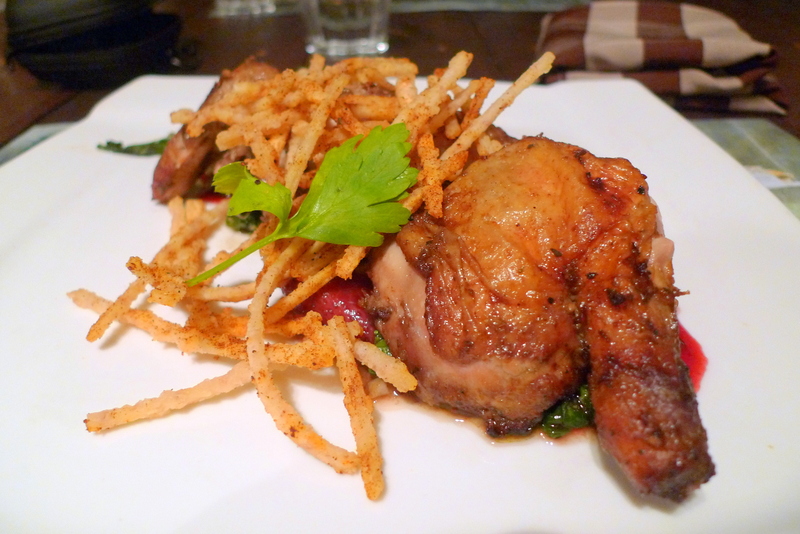 Finally, I had the Moroccan Spiced Baby Chicken($19++). Fancy euphemisms apart, this is just a forgettable Roasted Baby Chicken with Yam Crisps. The Chicken isn’t particularly tender, moist nor succulent but the Yam Crisps are a well deserved change from the usual fries. 2 Hits and 2 Misses for dinner, but one thing good about the thriving superficiality in Dempsey, it ensures a constant supply of good eye candy! Categories : All YumYums in my TumTum, Cuisine Type YumYums, Dempsey / Holland V, Location of YumYum, Western, Yummy!